Although we have our own import/export solution for both Magento 2 and Magento 1 – Improved Import Magento 2 Extension; Improved Import Magento Module – it is also necessary to draw your attention to some alternative solutions. Therefore, today we’d like to shed light on Efficient Order Export by Amasty. This tool offers only export features but does everything quite well. It is also necessary to mention that we’ve compared Amasty Efficient Order Export for Magento 2 with other modules here: Magento 2 Order Export Extensions Comparison. Export data generated by other modules. If you need to export orders from your Magento website, Amasty can provide you with a fast and flexible module that lets you export all possible order data to CSV or XML. 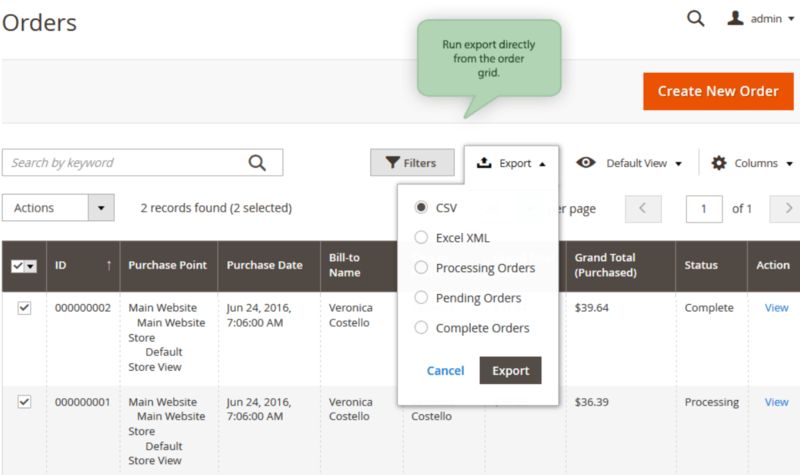 The Magento 2 order export tool works with billing and shipping addresses, product information (invoice, shipment, product and credit memo) and exports data from other extensions. Your order export process becomes fully automated, and you can send the results by email or use an FTP upload. If you want to know more about features of the extension’s export profile, we should say that it is excellent. Every profile provides the ability to export only the latest orders. 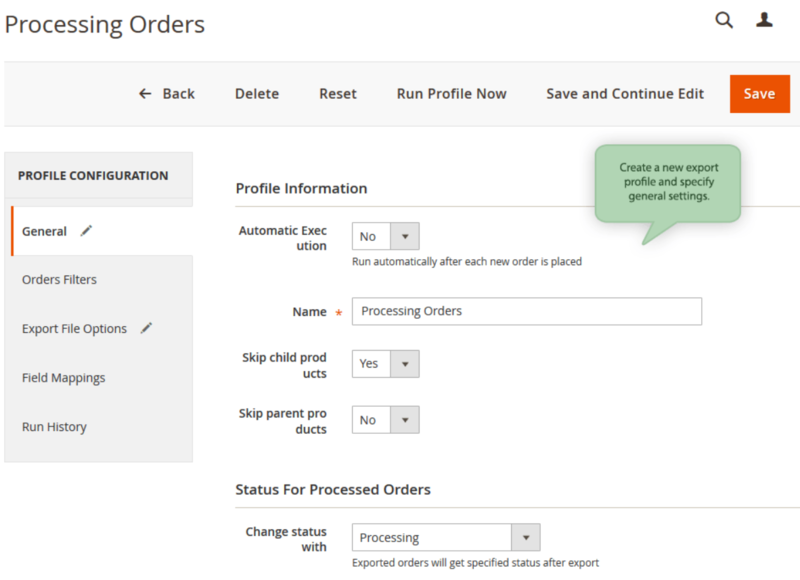 If you’ve already performed an export procedure, the Magento 2 order export module will create an output with data related to the most recent orders that have never been transferred. Furthermore, you can adjust the whole export procedure to your specific ecommerce needs. It is also necessary to mention that Amasty Efficient Order Export for Magento 2 and 1 provides the ability to send exported files by email automatically and view them in the .csv or .xml format. You only need to specify a schedule that is convenient for you. Besides, Amasty Efficient Order Export for Magento 2 and 1 lets you automate the way order status for exported orders changes. You can set it to be changed from processing to complete after the export process is finished. 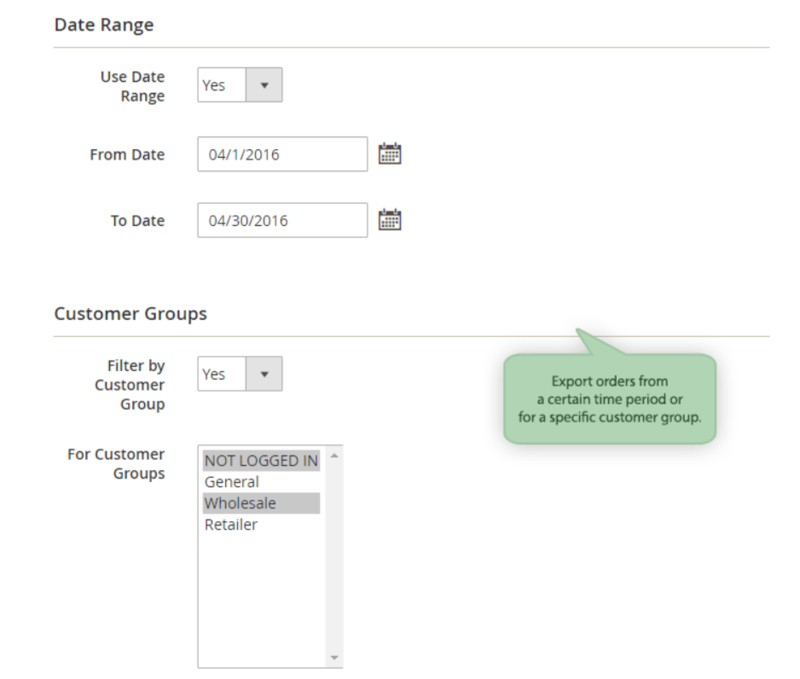 The Magento 2 order export extension even enables you to divide your order export according to customer groups. As a result, you can easily get all necessary information about each customer group, as well as analyze how profitable it is and what needs to be changed in your marketing policy. 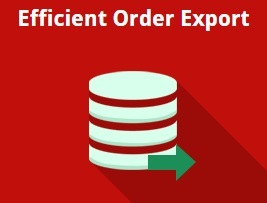 Besides, you can export orders for a specified period, as well as obtain order data starting from or till a specific order number. Furthermore, it is possible not to export items with a zero price, so you can easily avoid creating duplicates configurable products export. At the same time, you can simultaneously export orders based on all possible statuses, as well as start separate exports for a chosen order status or several certain ones in a single profile. Another important setting is related to time zones. It becomes very handy in case your server is situated in another time zone, but you want to get order data displayed in your local time. 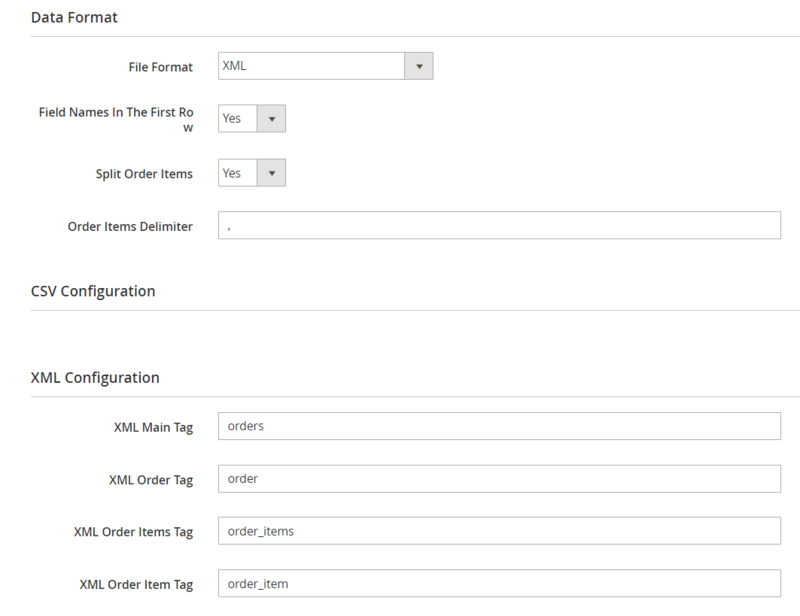 The Magento 2 order export extension lets you do this in a few clicks. Besides, it is possible to add a timestamp or use it as a folder name where exported data is saved. 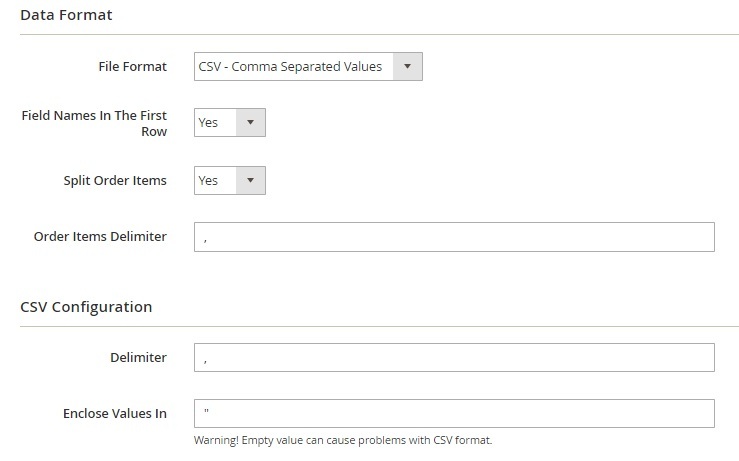 Since Amasty Efficient Order Export for Magento 2 and 1 supports both XML and CSV formats, you will enjoy a convenient output that is easy to use for further processing. Another feature that makes this Magento extension so valuable is the ability to run export profiles from a grid where all your orders are situated. As a result, there is no need to switch between tabs to get desired export results. With Amasty Efficient Order Export, you get everything you need to know about orders, as well as decrease time required to perform routine tasks. 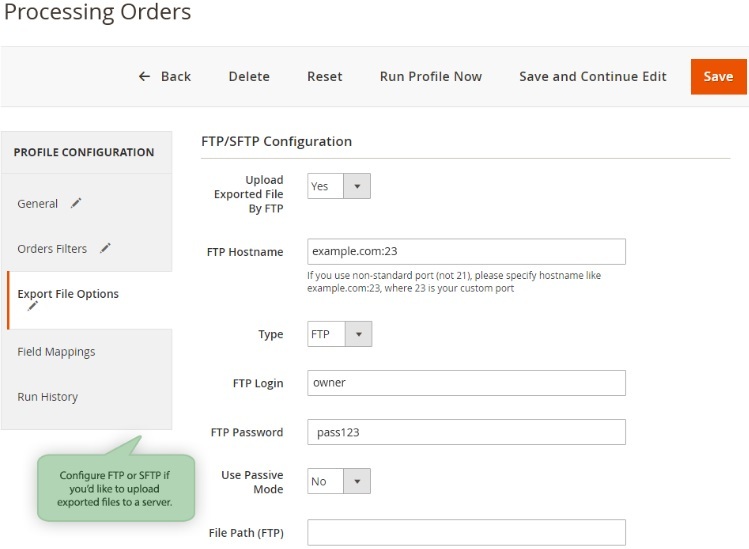 In addition to the ability to send export files by email, Amasty Efficient Order Export for Magento 2 and 1 lets you save them on a local server or upload via both FTP and SFTP to another one. 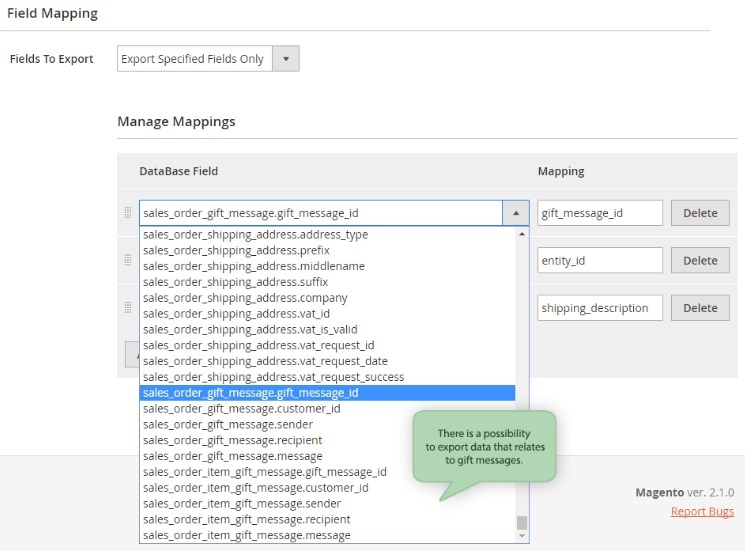 Since the Magento 2 order export module was designed with its users in mind, it provides convenient field mapping. The extension offers an opportunity to create new custom values that combine several fields from your database. For instance, it is possible to combine ‘Name’ and ‘Last Name’ fields in a ‘Full Name’ column or get a customer address in a single line. As for exported files, they also have a wide variety of customizations. Thus, you can easily fine tune the extension to export each ordered product custom option in a separate column; the same is about product attributes. Besides, it is possible to choose date format and specify date and time for an export file title. Another important setting lets you select sorting order for fields in a file, and you can add fields with static values at the beginning as well as at the end of it. Google Trusted Stores support: shipment and cancellation feed. As for export profiles, they are available under System -> Efficient Order Export -> Profiles. The Profiles grid displays such parameters as profile ID, name, and corresponding store view. Besides, it shows whether auto execution is enabled or not. 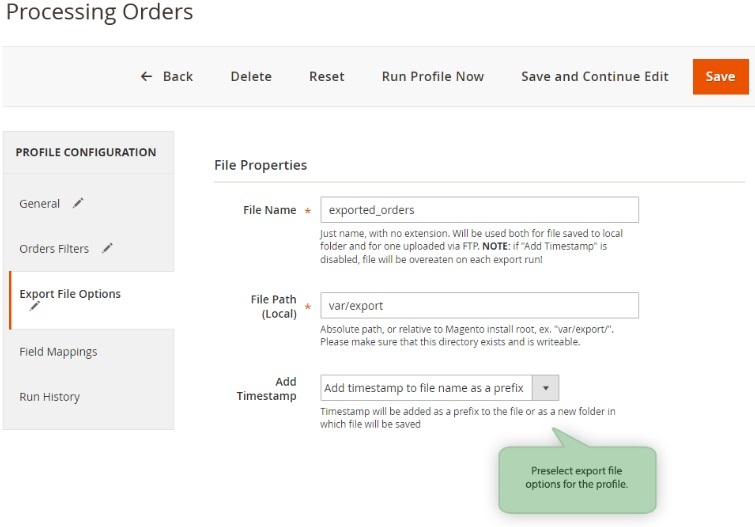 While adding a new profile, the Magento 2 order export extension provides 5 tabs: General, Orders Filters, Export File Options, Field Mapping, and Run History. 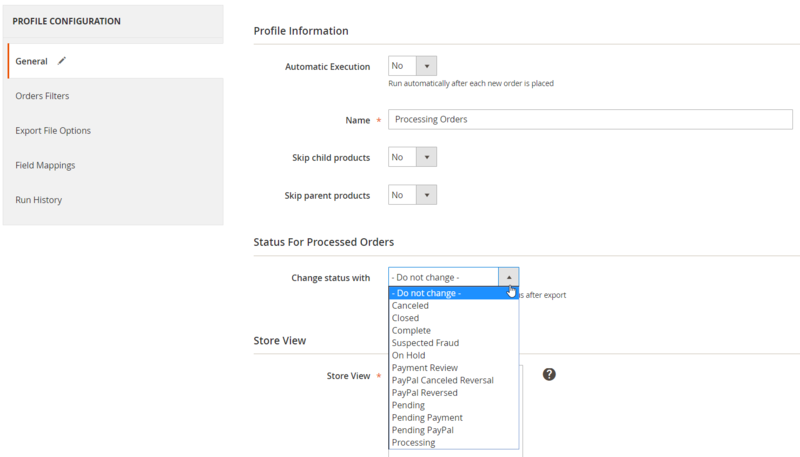 Under the first one, you can enable/disable automatic profile execution, specify its name, decide whether to skip child/parent products or not, select status for processed orders (not changed or any of the available statuses), and choose a store view from which to export orders. 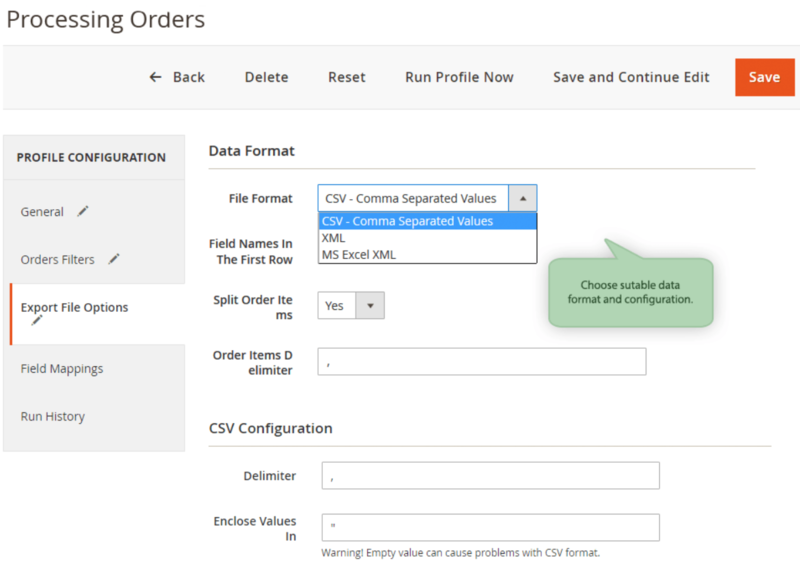 In Orders Filters, you can configure the following filters: Order Number, Invoice Number, Shipment Number, Date Range, Customer Groups, and Order Status. 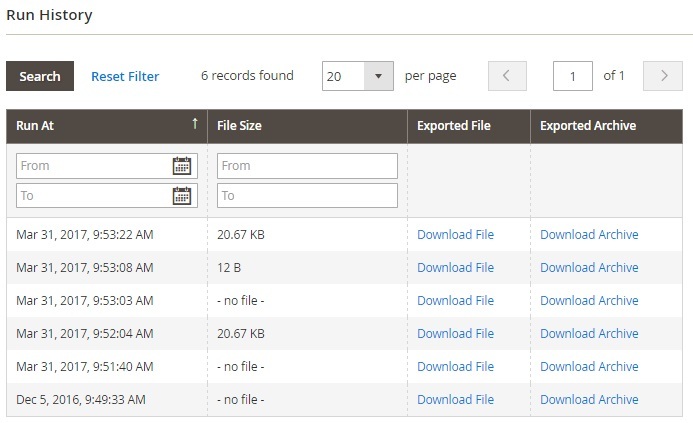 As for the Export File Options tab, it is divided into 6 sections: File Properties, Data Format, CSV Configuration, XML Configuration, FTP/SFTP Configuration, and Email Settings. In File Properties, type a file name, local path, and decide what to do with a timestamp (nothing, it will be added as a prefix to the file, or as a new folder). In Data Format, select file format (CSV, XML, or MS Excel XML), enable/disable Field Names In The First Row, decide whether to split order items, and specify order items delimiter. 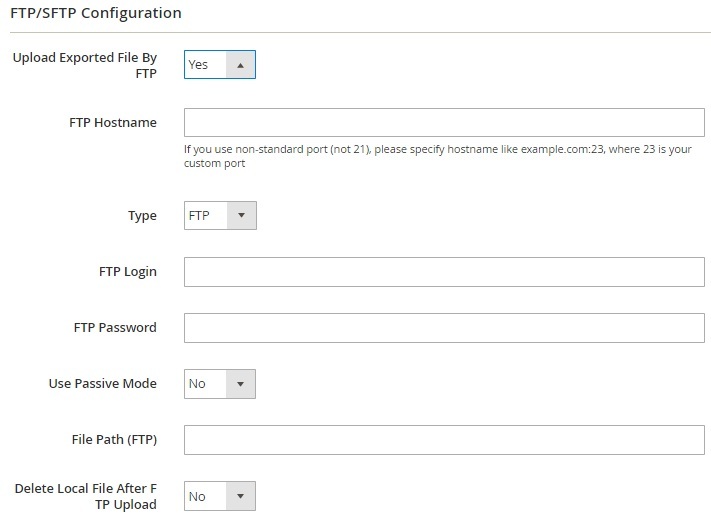 In FTP/SFTP Configuration, enable the feature, type FTP Hostname, choose its type (FTP or SFTP), specify FTP Login and Password, enable/disable passive mode, enter FTP file path, and decide whether to delete the local file after FTP upload. In Email Settings, enable/disable the feature, select sender contact, specify recipient, type message subject, and decide whether to compress exported files in the ZIP. 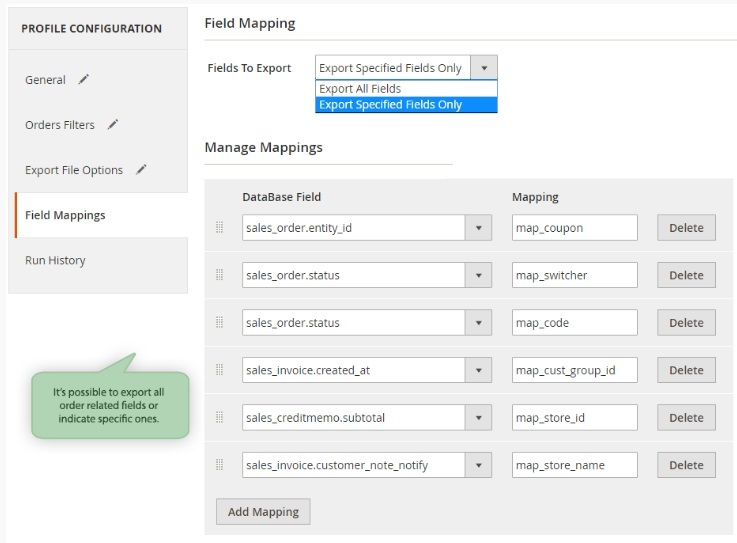 Below, we show how the mapping functionality is implemented: In Fields to Export, select Export Specified Fields Only. Next, add all the necessary fields and enter new names next to each database field. Check the last tab to view how many times the profile has been run. You can see the date of each run, as well as the size of the corresponding file with exported orders. It is possible to download that file, as well as download data as an archive. The history of all Magento 2 order exports is available in the similar grid under System -> Efficient Order Export -> History. To export data from third-party extensions, navigate to System -> Efficient Order Export -> 3rd Party Link. There is a grid displaying a third party ID, name, and table to join. If you want to add a new third-party profile, define its field name, database table for extracting the data, and base and referenced table keys. This was our short tutorial to the backend section of the Amasty Efficient Order Export Magento 2 extension. As you can see, the extension provides a very effective way to export all orders via profiles. As a Magento 2 administrator, you can fully configure these profiles to streamline Magento 2 order export with custom options and advanced configurations. Static fields can be added to the export profile now. A new option was introduced: possibility to start export by calling a special URL. The feature is useful for integrations. A new export setting was implemented: now the module can exclude bundle and configurable products from the export and skip parent products. A new feature, allowing export of product attributes was added. A possibility to export gift message information was added. Ability to modify sender email for export type “By Email” was added. We’ve just reviewed a very robust export tool for both Magento 2 and 1. If you don’t need any advanced import features, you can freely install Amasty Efficient Order Export and leverage all its potential. 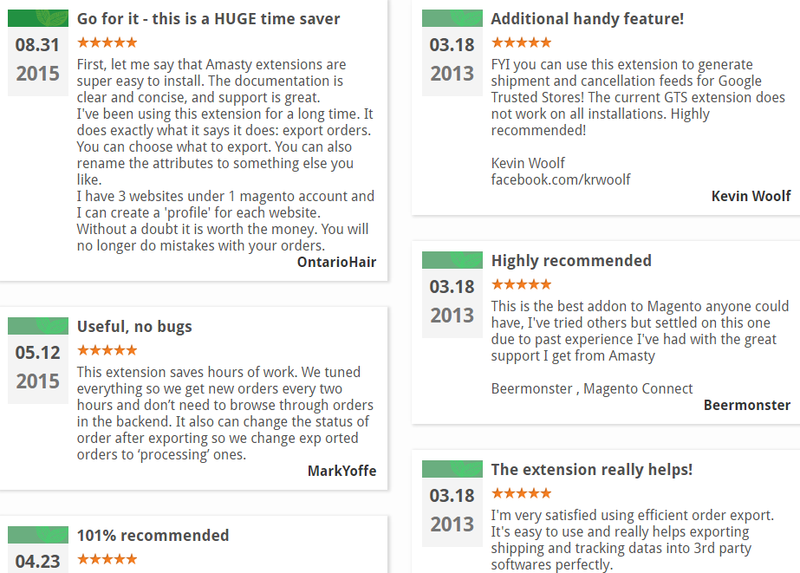 The Magento 1 extension costs $149, which is a very reasonable price. The price of the Magento 2 module is $219, but now you can get with a discount for just $197! If you are looking for advanced import features, try this one: Improved Import for Magento 2 and Magento 1.